There’s no doubt that when putting together your dream bike that its got to perform as well as being comfortable to ride. After all there is nothing more tragic that a nice bike getting stuck in the shed and not being ridden. A big factor in determining comfort is the bike saddle or bike seat or as we prefer to refer to it as a Throne. We get asked all the time what makes Thrones bike seats so special and how are they different than everything else on the market. After all they’re are a lot of bike saddle brands on the market – Fizik, Selle Italia, Selle SMP, Prologo, ISM, Brooks, Specialized, the list goes on. In this comprehensive bike saddle review we will share our views on this most important piece of equipment and we will also share some of the thoughts on our competition. When we developed Thrones we came at it from a very clear and practical approach – we wanted it to be good for riding. We didn’t test it in labs or on stationery bikes we tested on the bike out riding. Thrones was developed by riders, tested by riders and ultimately its ridden by riders. The thing that really stood out when were developing our bike seat was that riders are fidgety – they ride like they are doing a strange love dance with their bike. Maybe thats why bike riders always stick their arse out on the dance floor or is that just me. – Check out my Drivers: My quads are so strong I’m not going to sit down. – Hot Seat: The on the saddle off the saddle and back on the saddle move. All of the special dance moves or riding positions were carefully considered when we developed, refined and ultimately finalised our bike seat design and shape. Here are a collection of some of the best bike saddle brands on their market and what they are designed for. Great Italian bike seat brand that has been around for a while now. Fizik uses the Spine Concept to determine the most appropriate saddle for the rider. The Spine Concept classifies riders into 3 animal groups, the snake, the chameleon and the bull, and each animal group has a specific seat designed for them. How do you determine which animal you are? The Snake – no its no whether you’re slightly slimmy and dodgy character, its to do with whether you can touch your toes or not. If you can touch your toes comfortably then you’re a Snake and the Arione saddle is for you. The bull – If your anger levels increase with the site of a red rag this might be for you, but more importantly this is designed for the rider that can’t touch your toes. If you can’t get you hands past you knees well you should probably do some stretching, but more importantly the Fizik Aliante saddle is for you. Selle SMP is another bike saddle you’ll see out and about. They are big believers in the theory that if its ugly it must be good for you. If thats the case this must be one of the better bikes seat on the market. Selle SMP has been designed by Ergonomaticists. If you understand what your ischial tuberosities from your superior ramus of the ischium then this seat is for you. Unlike some of the other bike seat brands, Specialized is much more than just bike seats. They are a massive company making everything from frames to pumps and everything in between. They have big budgets so they must be doing something right. Specialized bike saddles are all about the ischial tuberosities, or for the simpler amongst us, the sit bones. They believe that the seat for you is determined by the sit bones and they use the BG fit approach to determine this. You get measured up and hey presto the fit machine tells you which saddle is best for you. Specialized saddles come in various widths – 130, 143 and 155 cms. Some believe that the sit bones only come into play when your sitting more upright, so more of an issue for the tourer. 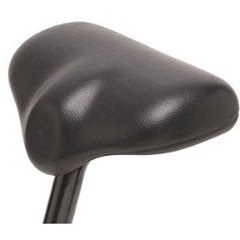 The Specialized seat range includes the Toupe (pictured), Romin, Avatar, Phenom and Henge. 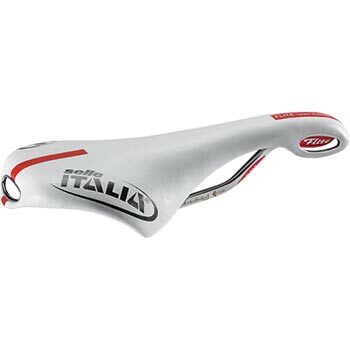 Selle Italia are arguably the best bike seat brand in the world. They certainly have the heritage in the industry and those Italians do have a great sense of style. Selle Italia don’t get lost in all the jargon and technical stuff, they just make great seats. Big range of seats for road and off road including the SL, SLC, SLK, SLR, Flite, Optima, Turbomatic, Prolink, etc, etc. Prologo are one of the newer players on the market. They have an extensive range of bike saddles to suit all riders, styles and budgets. Their range includes the Nago Evo, Scratch Pro, Choice, C.One and Kappa. If you like old British sports cars and prefer to do your riding in tweed Brooks are for you. Brooks bike saddles have been around since the start of time. They are still made the same way, leather, metal and springs. Lovely looking seat. ISM or Ideal Saddle Modification claim to be the “World’s most comfortable bike seat”. Big call, but they are putting it out there. The ISM or Adamo has taken the cut away to a new level, they didn’t just cut the middle out of it, they also cut the tip off it. What you’re left with is a 2 pronged or U shaped bike saddle. They appear to have a lot of female triathletes riding them so we assume they must be good for long time trials in the one position. Can I buy this seat in Australia?